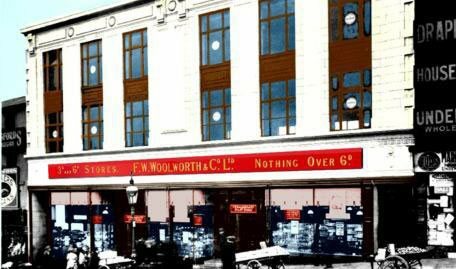 Woolworth went from strength to strength in the 1920s. On both sides of the Atlantic there were changes at the top, bringing new ideas for merchandise and increased momentum to the chain's expansion. More than 400 stores were opened in Britain and Ireland, many of them freehold properties which were purpose-built to order, while the Americans opened a whole new subsidiary in Weimar Germany. Both companies missed a trick though in allowing a copycat to register the brand name in Australia and begin an opening programme down under. 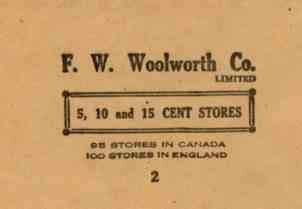 By 1929, as the parent celebrated its fiftieth birthday Stateside, Woolworth had become the first truly international retailer. But challenges lay ahead. Rivals in North America had started to add higher priced lines, and it was increasingly difficult to source profitable lines to sell for 10¢. Labour market reforms would also test the Board's ability to keep the cost base low in the 1930s. Fred Moore Woolworth, Frank's second cousin, was the founding MD in Britain. He had extensive experience of managing stores and the reshipping warehouse in the USA, and had inherited some of his mentor's bravado. Under his leadership the formula took hold more quickly than it had in North America. He successfully anglicized the brand, giving the new-born a distinct personality. Openings had continued, albeit at a slower pace, though the World War. The pace accelerated after the Armistice. 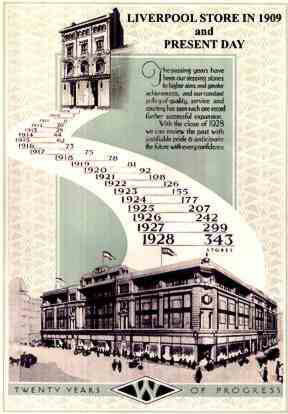 The hundredth store opened in Mansfield in July 1921. 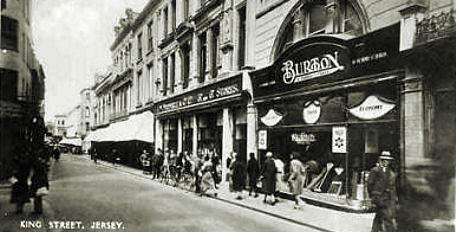 By then Woolworth spanned the length of the British Isles, even including a store in St Helier, Jersey in the Channel Islands. Fred led from the front, spending much of his time in-store. Like his cousin, he got involved with suppliers and reviewed contractual matters personally. He rarely missed a Board Meeting. But he was also cautious and risk-averse. Success brought financial rewards and high society status. To the media he was the "Mr Woolworth". Indeed his son Norman Bailey Woolworth Pauline later married the society belle Pauline Stansbury at Westminster Abbey, The event featured in one of British Pathé's early cinema newsreels. But success came at a price to Fred's health. In the summer of 1922 he suffered a stroke on a dash home to the USA to visit his mother, who had been taken ill. Not allowing himself time to recouperate he hurried back to the UK, but for the first time in fifteen years was too ill to attend Board Meetings. His health rallied briefly in December, allowing him to chair the firm's post-Christmas review, before suffering a fatal stroke on 27 January 1923. The stores were instructed to close. Most of the staff knew their MD personally and were so shocked that they needed time to absorb the news. To everyone's relief the American parent company picked an insider to be Fred's successor. William Stephenson was a popular choice. He had been the sole British member of the founding team. The Yorkshireman had made a name for himself both for his kindly manner and his sharp commercial instinct. Stores knew him as both friendly and demanding and considered him firm but fair. Buyers and fellow Directors respected Stephenson and understood exactly why the Founder had sought him out to join the team. Stephenson had privately harboured concerns that his boss had become too conservative as the company grew. As the formula had taken hold it had generated such large profits that Fred Woolworth had been unwilling to make changes to the ranges or the store environment. The new MD knew the store must evolve to stay on top, and the Board would need to take risks to maximise the potential. Under his leadership the pace of openings accelerated rapidly helping profits to rocket. By the time Stephenson retired after World War II, the chain had grown to 770 stores and had become the country's most successful retailer. Its shares topped the market. In a retirement address he put the success down to luck, and the solid foundations that Fred Woolworth had laid. The envelope shows how the Canadian stores emphasized their links to the UK rather than the USA in the Twenties.